H. Rick Bamman - hbamman@shawmedia.com The Land Conservancy of McHenry County volunteer clears branches from the Crowley Sedge Meadow work site near Harvard on Wednesday, Jan. 15, 2014. 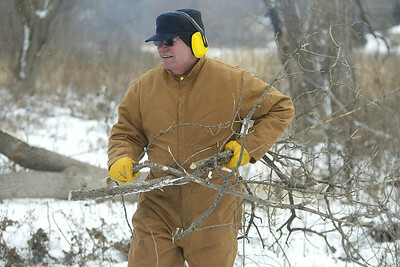 H. Rick Bamman -hbamman@shawmedia.com The Land Conservancy of McHenry County volunteers Ted Thorton (right) of Crystal Lake cuts a Box Elder tree apart as Jim Thompson of Harvard tosses a log on the burn pile. The two were working with other volunteers clearing brush and trees at the Crowley Sedge Meadow east of Harvard on Wednesday, Jan. 15, 2014. 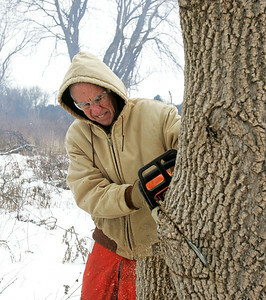 H. Rick Bamman - hbamman@shawmedia.com The Land Conservancy of McHenry County volunteer Ted Thorton of Crystal Lake, makes a second strategic cut with a chain saw on a Box Elder tree while working at the Crowley Sedge Meadow east of Harvard on Wednesday, Jan. 15, 2014. 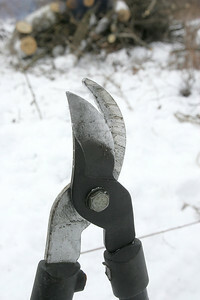 H. Rick Bamman - hbamman@shawmedia.com Lopping shears stand in the snow during a The Land Conservancy of McHenry County work detail in the Crowley Sedge Meadow east of Harvard. 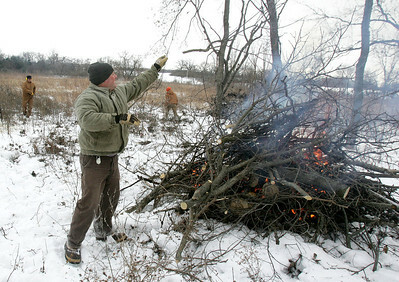 H. Rick Bamman - hbamman@shawmedia.com The Land Conservancy of McHenry County land stewardship specialist Melissa Hormann (cq) trims on-native species brush at the Crowley Sedge Meadow near Harvard on Wednesday, Jan 15, 2014. H. Rick Bamman - hbamman@shawmedia.com The Land Conservancy of McHenry County volunteer Randy Schietzelt (cq) (center) of Crystal Lake thows branches onto the fire as Pat Moser (left) of Cary and LCMC stewardship specialist Melissa Hormann (cq) (right) clear brush and trees at the Crowley Sedge Meadow east of Harvard on Wednesday, Jan. 15, 2014. 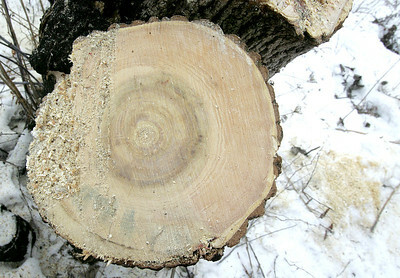 H. Rick Bamman - hbamman@shawmedia.com A fresh cut Box Elder tree shows its age after The Land Conservancy of McHenry County volunteers worked at the Crowley Sedge Meadow near Harvard. 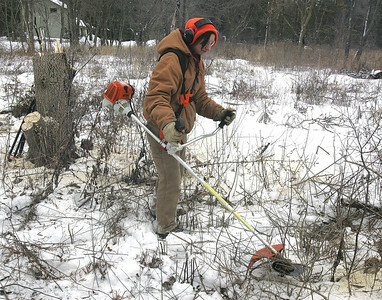 Lopping shears stand in the snow during a The Land Conservancy of McHenry County work detail in the Crowley Sedge Meadow east of Harvard.